It has long been known that bystanders are often the true first responders to the scene of an injury, but more times than not the general public has no training or equipment to render care to an injured person. The Audio Bleeding Control Kit from North American Rescue removes both of those obstacles by providing life-saving bleeding control products in a small, portable box capable of being stored on a bookshelf, desk, etc. for easy access. The instructions for application of the bleeding control items are read aloud in either English or Spanish, and the user can listen and follow along providing care as it plays. After the events of Sandy Hook Elementary School, the American College of Surgeons convened a committee to recommend a national policy to enhance survivability from active shooter and intentional mass casualty events. This collaborative effort featured the National Security Council, the FBI, the US Military and others, and their recommendations were called the Hartford Consensus. The Hartford Consensus promotes improving survival with the mantra “See Something, Do Something.” The intent is that chance of survival can be greatly increased if the first person on the scene provides at least some level of care until the trained professionals arrive with more definitive care. The Audio Bleeding Control Kit empowers and equips each and every individual, trained or untrained, with the resources to actually “Do Something” to improve survival. 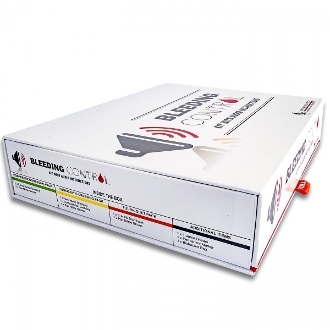 The Audio Bleeding Control Kit differentiates between severe bleeding (to an arm or leg only), moderate bleeding, or minor bleeding to help the user determine which supply pack to use. The supply packs are easily identified as they are color coordinated, and they are easy-to open with tear notches featuring NAR Signature Red-Tip Technology®. The audio module is equipped with Play/Pause buttons for each supply pack type, as well as back, forward, and stop buttons for ultimate control over the pace and order of instructions. A power button on the audio module also preserves battery life until the unit is required, and volume control is also provided (default volume is max for use in loud or chaotic environments). Audio Bleeding Control Kits are available with the option of a either a Black or Orange C-A-T® Gen 7 Tourniquet. Re-supply packs are also available for each supply pack module. For additional Audio Boxes without contents, please call customer service for details. 1 x pair Trauma Shears, 7.25 in. Box Size: L 12.5 in. x W 9.75 in. x D 2.6 in.